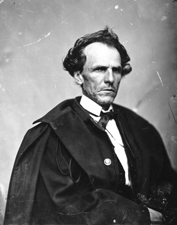 LANE, James Henry, (son of Amos Lane), a Representative from Indiana and a Senator from Kansas; born in Lawrenceburg, Ind., June 22, 1814; attended the public schools; studied law; admitted to the bar in 1840 and commenced practice in Lawrenceburg; member of the city council; served in the Mexican War; lieutenant governor of Indiana 1849-1853; elected as a Democrat to the Thirty-third Congress (March 4, 1853-March 3, 1855); moved to the Territory of Kansas in 1855; member of the Topeka constitutional convention 1855; elected to the United States Senate by the legislature that convened under the Topeka constitution in 1856, but the election was not recognized by the United States Senate; president of the Leavenworth constitutional convention in 1857; elected as a Republican to the United States Senate in 1861; reelected in 1865 and served from April 4, 1861, until his death; chairman, Committee on Agriculture (Thirty-eighth Congress); appointed by President Abraham Lincoln brigadier general of volunteers and saw battle during the Civil War; deranged and charged with financial irregularities, Lane shot himself on July 1, 1866, but lingered ten days, dying on July 11, near Fort Leavenworth, Kans. ; interment in the City Cemetery, Lawrence, Kans. American National Biography; Dictionary of American Biography; Dean, Virgil W. John Brown to Bob Dole: Movers and Shakers in Kansas History. Lawrence: University of Kansas Press, 2008; Collins, Robert. Jim Lane: Scoundrel, Statesman, Kansan. Gretna: Pelican, 2007; Bailes, Kendall. Rider on the Wind: Jim Lane and Kansas. Shawnee Mission, Kans. : Wagon Wheel Press, 1962.